Bukartilla and Tineriba Gallery in Hahndorf, South Australia is an iconic tourist attraction with a gallery focused on the Gemstones of Australia, including opals, other gemstones and the jewellery made with them. Visit on your next trip to South Australia. Opal is Australia’s National Gemstone – it produces about 95% of the gem grade opal going on the international market. Many people are surprised at the extent of the variation within opal – no two opals are identical. Solid Black opal is one of the most expensive of gemstones, the value of good stones being on a par with rubies, emeralds and diamonds. We have stones in the price range of $100 per carat up to $5000 per carat. This is the most commonly found class of opal in Australia. It can be full of colour, but because that colour is displayed against the milky-white body colour of the stone, the colours are less evident than in the other classes. It is found in all the opal areas in Australia. Price range from $20 per carat to $60 per carat. Solid Crystal opal, in the best crystal the stone is transparent, but harbouring brilliant flashes of colour throughout. Stones with slight milkiness, but brilliant colour are some what reduced in value. This is a popular type of opal, found at Mintabi, South Australia, and White Cliffs and Lighting Ridge in New South Wales. The value range is from $100 per carat up to $500 per carat. This is a special type of solid opal only found at Andmooka. When mined it is porous and often white. The natural colours don’t display well against the white body so this variety of opal is usually cooked in a sugar solution. During this process a small amount of the sugar permeates the porosity of the stone, and this is carbonised by the cooking process, leaving a minute amount of black carbon in the pores of the opal. 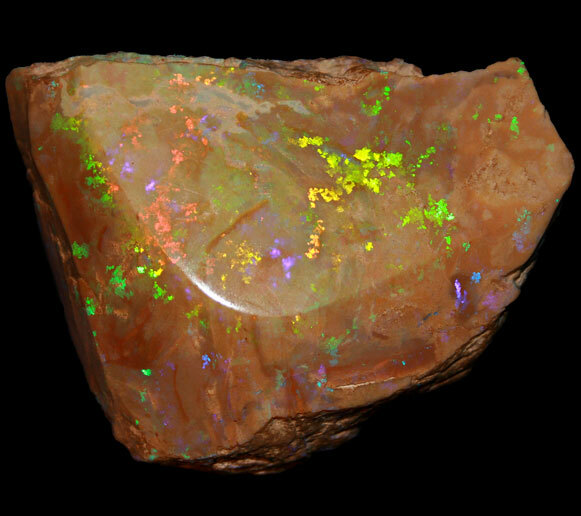 This highlights the beautiful natural colours in the matrix opal, some of which is equivalent in colour to that of the black opal. Price range $15 per carat to $150 per carat. Opal occurs over thousands of square kms in western Queensland, where it is found as narrow veins and impregnation in iron rich sandstone. The naturally dark host rock highlights the colour which can be very vibrant and striking. The price range for Boulder opal is from $20 per carat to $1000 per carat. Almost invariably, boulder opal, as with all high quality opal, is cut to a freeform shape to maximaize the use of the natural material and optimize the play of colour. In some of the opal fields the dark ironstone matrix is filled with flashes of brilliant colour. While the opal is too minute to separate from the stone, when the matrix itself is polished often a beautiful flashing gemstone can be obtained. Stones are valued at $10 per carat up to $100 per carat. 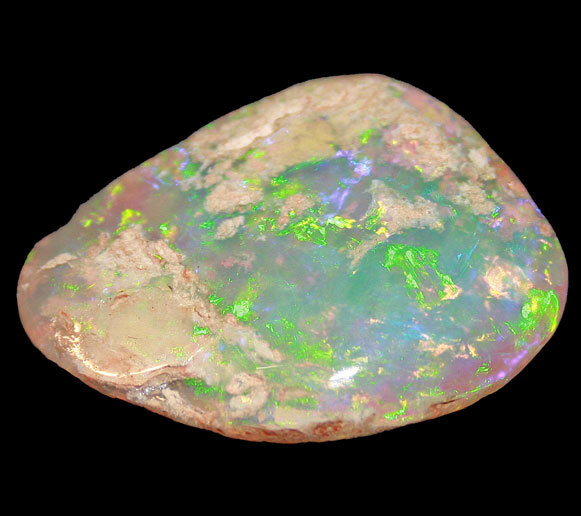 Sometimes the best colour can be obtained from an opal when a slice of it is cemented to a dark background. Often this is a thin slice of Queensland boulder. Over recent years fashion has dictated that this is much sought after, providing bright beautiful colour at a fraction of the cost of a solid. Price is determined by colour brilliance and size and varies from $40 per stone up to $3000 per stone. A thin layer of opal, often of very good quality, is cemented to a black base, to highlight the colour, then capped with a rounded covering of ‘quartz’, to protect the thin layer of opal. Because only a thin layer of opal is used in the stone, the cost of a triplet is much less than that of a solid stone with equivalent colour. However, brilliantly coloured triplets can be more valuable than lower quality solid opals. Price is determined by colour, brightness, and size. Price range is from $5 per stone up to $1000 per stone. A great variety of opals are available and each type has its own advantages and disadvantages. Selection should be made on the basis of the particular taste of the customer, the use to which the stone will be put, and the amount of money on wishes to invest. Opal is the opal gem where virtually every stone is unique, each with its own colours, patterns, shape and interaction with light.